Browsing articles tagged with " Ricerche"
Tecnostress/Technostress: Review delle recenti ricerche internazionali. Ho fatto un giro sulla rete alla ricerca di qualche studio recente relativo al tecnostress. Non ho trovato molte cose ‘fresche’ – giacché questo sito ha già pubblicato periodicamente tutte le principali ricerche e studi relativi all’argomento – ma integro con alcune ricerce su aspetti estremamente differenti del tecnostress che potete leggere di seguito con l’abstract in lingua originale. Facendo questa ricognizione sono emersi due dati: il primo è che alcune ricerche e articoli scientifici sul tecnostress sono rilasciati solo a pagamento (il link rimanda direttamente alla pagina di presentazione e vendita dell’articolo); il secondo è che la ricerca sul tecnostress è oramai svolta a livello mondiale. This paper aims to provide systemic understanding with regard to the adoption of computer mediated communication (CMC) technology and its impact on technostress levels. Based on the theoretical lens rooted in the psychology literature and emerging problems observed through engagement with organizations in our field research, we propose a conceptual model that articulates technology characteristics in telemedicine communication. The model defines both the antecedents and outcomes of technostress, emphasizing investigation of the underlying mechanisms of the overall process in regard to fit between users and adopted technologies. The proposed model identifies the antecedents of technostressors in regard to the use of telemedicine technologies, and provides the means to examine the process systematically. It could be useful for administrators to constitute organizational strategy to alleviate stress levels, thus improving work performance and quality of working life. Articolo a pagamento. This paper examines the level of technostress among academic librarians in the Malaysian public universities. The highly automated workplace environment causes technostress to become a common phenomenon among academic librarians. Based on related technostress theories, five dimensions of technostress were determined. A total of 162 academic librarians from nine public universities of West Malaysia were chosen as respondents for this study. A cross-sectional survey was carried out and data were collected using online self-administered survey. The results of the descriptive analysis indicate that, in general, the academic librarians experienced moderate level of technostress in their workplace. With regards to the technostress dimensions, the respondents were found to experience high level of techno-uncertainty and moderate level of techno-overload and techno-complexity. The findings, however, show that the respondents were only experiencing minimum level of techno-invasion and techno-insecurity. Ottima bibliografia specifica in chiaro. Articolo a pagamento. Technology is a mobile and integral part of many work places, and computers and other information and communication technology have made many users’ work life easier, but technology can also contribute to problems in the cognitive work environment and, over time, create technostress. Much previous research on technostress has focused on the use of digital technology and its effects, measured by questionnaires, but in order to further examine how technostress arises in the modern workplace, a wider perspective on interactions between people and technology is needed. This paper applies a distributed cognition perspective to human–technology interaction, investigated through an observational field study. Distributed cognition focuses on the organisation of cognitive systems, and technostress in this perspective becomes an emergent phenomenon within a complex and dynamic socio-technical system. A well-established questionnaire was also used (for a limited sample), to gain a frame of reference for the results from the qualitative part of the study. The implications are that common questionnaire-based approaches very well can and should be complemented with a broader perspective to study causes of technostress. Based on the present study, a redefinition of technostress is also proposed. Ottima bibliografia specifica in chiaro nel tab ‘References’. Articolo a pagamento. The research reported in this paper studies the phenomenon of technostress, that is, stress experienced by end users of Information and Communication Technologies (ICTs), and examines its influence on their job satisfaction, commitment to the organization, and intention to stay. Drawing from the Transaction-Based Model of stress and prior research on the effects of ICTs on end users, we first conceptually build a nomological net for technostress to understand the influence of technostress on three variables relating to end users of ICTs: job satisfaction, and organizational and continuance commitment. Because there are no prior instruments to measure constructs related to technostress, we develop and empirically validate two second order constructs: technostress creators (i.e., factors that create stress from the use of ICTs) and technostress inhibitors (i.e., organizational mechanisms that reduce stress from the use of ICTs). We test our conceptual model using data from the responses of 608 end users of ICTs from multiple organizations to a survey questionnaire. Our results, based on structural equation modeling (SEM), show that technostress creators decrease job satisfaction, leading to decreased organizational and continuance commitment, while Technostress inhibitors increase job satisfaction and organizational and continuance commitment. We also find that age, gender, education, and computer confidence influence technostress. The implications of these results and future research directions are discussed. Login con password obbligatorio. Despite its importance, the process of technostress remains significantly unstudied in MIS research. Here we reviewthe relevant literature on technostress and synthesize the coping model of user adaptation (Beaudry andPinsonneault, 2005) with transaction based models of technostress to align these theories with referent models ofstress, appraisal and adaptation. We posit that technostress should be studied as a dynamic, unfolding process, not asan assumed, static black box. We present a dynamic process model of technostress as it was intended by Caro andSethi (1985), which reconciles technostress with more than 60 years of stress research. 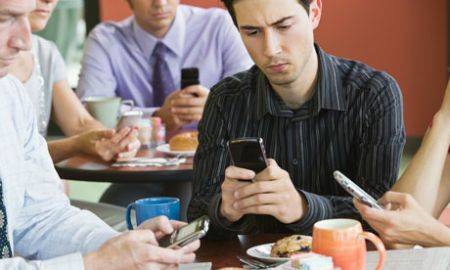 The proliferation of information and communication technology (ICT) throughout workplace and home life is thought to increase feelings of being overloaded, drained, and/or burned out. This phenomenon is termed “technostress.” In this relatively new line of research, scholars have employed predominantly questionnaire surveys and experiments to investigate the phenomenon. This paper argues for an interpretive, theory building approach for studying techno stress, motivated by two shortcomings of these data collection techniques: questionnaire surveys rely on potentially imperfect participant recall, while experiments cannot find root causes of techno stress during the course of a normal work day. Linking periods of bodily-experienced stress measured by heart rate variability with qualitative data enables an interpretive, theory building approach that allows for a richer understanding of whether and how ICT contributes to stress. This descriptive study examined work values, achievement motivation and technostress as determinants of job burnout among the library personnel in federal universities in Nigeria. The study adopted a descriptive survey research design and 646 library personnel from 18 automated federal university libraries participated in the study. The sampling technique used was single stage random sampling technique. Five instruments were used for this study namely: work values, achievement motivation, job burnout and technostress scales synchronized into a questionnaire titled (WVAMJOBTS) and structured interview checklist. Each of the research instruments was validated with a reliability coefficient of 0.90, 0.82, 0.82, 0.95 and 0.62 for work values, achievement motivation, job burnout, technostress and structured interview checklist respectively using Cronbach-alpha method. Data collected were analysed using percentages, mean, standard deviation, product moment correlation and multiple regression analysis. Research questions were answered and research hypotheses tested at 0.05 level of significance. The results of these analyses revealed that the respondents had moderate level of work values and achievement motivation and high level of technostress and job burnout, work values and achievement motivation of the respondents were inversely related to job burnout, whereas technostress was positively related to job burnout. Technostress was found to have the highest relative contribution among the independent variables to the problem of job burnout. Based on the findings, recommendation were made to solve the problem of job burnout among the library personnel in federal universities in Nigeria. 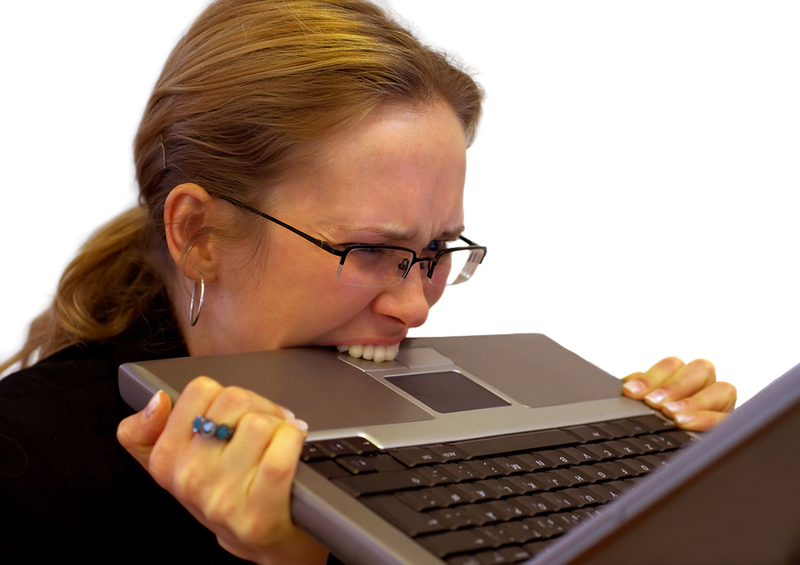 The strain experienced by computer-users due to the rapid developing computer environment, known as technostress, is often ignored seeing that it is not seen as a real type of psychological stress such as post-traumatic stress etc. This paper is concerned with showing that there is theoretical congruence between computer-related technostress and psychological stress. This is accomplished by examining the onset and nature of psychological stress and comparing it with the characteristics of computer related technostressat the hand of a well-recognised psychological stress model. The resulting finding made is that strong theoretical congruence exists. Come ben sappiamo dagli articoli presenti in tecnostress.it, la massiccia diffusione di internet e dei nuovi mezzi di comunicazione sta producendo da oltre un decennio il diffondersi di fenomeni psicopatologici collegati ad un uso eccessivo o inadeguato della rete che si manifesta con una sintomatologia simile a quella osservabile in soggetti dipendenti da sostanze psicoattive. Questo disturbo, catalogabile come un disturbo ossessivo-compulsivo, fu chiamato I.A.D. Internet Addiction Disorder dallo psichiatra americano Ivan Goldberg che già nel 1995 indicò i criteri diagnostici utili al riconoscimento di tale disturbo. Da allora, numerose pubblicazioni internazionali sull’argomento hanno posto l’attenzione al rischio di dipendenza da Internet e hanno messo in luce che l’utilizzo della Rete può indurre problemi di dipendenza psicologica e danni psichici e funzionali per il soggetto. Nellla pratica clinica, la dipendenza da internet o Internet addiction è in realtà un termine piuttosto vasto che copre un’ampia varietà di comportamenti, ai quali sottostanno da un punto di vista psicologico problemi nel controllo degli impulsi e difficoltà nel regolare gli stati emotivi dolorosi. Inoltre la dipendenza da internet e la dipendenza dal computer sono ormai inscindibilmente legate e a volte si usano i termini dipendenza online o dipendenza tecnologica per indicare il fenomeno nel suo complesso. – Dipendenza cibersessuale (o dal sesso virtuale): gli individui che ne soffrono sono di solito dediti allo scaricamento, all’utilizzo e al commercio di materiale pornografico online, o sono coinvolti in chat-room per soli adulti. La stessa può accompagnarsi a masturbazione compulsiva, vedi anche la più generale dipendenza sessuale. – Dipendenza ciber-relazionale (o dalle relazioni virtuali): si caratterizza per la tendenza ad instaurare rapporti d’amicizia o amorosi con persone conosciute on-line, principalmente via social o chat. Si tratta di una forma di relazione nella quale gioca un ruolo fondamentale l’anonimato, il quale permette di attribuirsi specifiche fisiche e caratteriali anche molto lontane da quelle che il soggetto presenta nella vita reale. Gli individui che ne sono affetti diventano troppo coinvolti in relazioni online o possono intraprendere un adulterio virtuale. Gli amici online diventano rapidamente più importanti per l’individuo, spesso a scapito dei rapporti nella realtà con la famiglia e gli amici. In molti casi questo conduce all’instabilità coniugale o della famiglia. – Net Gaming o Net Compulsion: la dipendenza dai giochi in rete comprende una vasta categoria di comportamenti, compreso il gioco d’azzardo patologico, i videogame, lo shopping compulsivo e il commercio online compulsivo. In particolare, gli individui utilizzeranno i casinò virtuali, i giochi interattivi, i siti delle case d’asta o le scommesse su Internet, soltanto per perdere importi eccessivi di denaro, arrivando perfino ad interrompere altri doveri relativi all’impiego o rapporti significativi. Queste attività hanno diverse caratteristiche in comune: la competizione, il rischio ed il raggiungimento di una immediata eccitazione. – Sovraccarico cognitivo o Eccesso di informazioni (Information Overloaded): la ricchezza dei dati disponibili sul World Wide Web ha creato un nuovo tipo di comportamento compulsivo per quanto riguarda la navigazione e l’utilizzo dei database sul Web. Gli individui trascorrono sempre maggiori quantità di tempo nella ricerca e nell’organizzazione di dati dal Web. A questo comportamento sono tipicamente associate le tendenze compulsive-ossessive ed una riduzione del rendimento lavorativo. – Gioco al computer: già negli anni ottanta i ricercatori scoprirono che il gioco ossessivo sul computer era diventato un problema nelle strutture organizzate, dato che gli impiegati trascorrevano la maggior parte del giorno a giocare invece che a lavorare. Oggi, con la diffusione dei giochi via Internet con più utenti contemporaneamente attivi e dei giochi di ruolo interattivi in cui il soggetto partecipa costruendosi un’identità fittizia, i ‘giocatori’ (di solito sempre molto giovani) sono sempre attivi nei loro ambienti ludici, con una conseguente crescita di forti dipendenze psicologiche. – le psicopatologie preesistenti. In più del 50% dei casi la IAD può essere indotta da alcuni tipi di disturbi psichici preesistenti. I fattori di rischio includono una storia di dipendenza multipla, condizioni psicopatologiche come disturbo depressivo, disturbo ossessivo-compulsivo, disturbo bipolare, compulsione sessuale, gioco d’azzardo patologico, o fattori situazionali, come sindrome da burnout, contrasto coniugale o abuso infantile. – le potenzialità psicopatologiche proprie della rete (anonimato e sentimenti di onnipotenza che possono degenerare in: pedofilia, sesso virtuale, creazione di false identità, gioco d’azzardo, ecc). Per soggetti in cura medica per IAD, le terapie ritenute più efficaci per curare questa Internet dipendenza sono sostanzialmente le stesse impiegate per gli altri tipi di dipendenza, come la terapia cognitivo comportamentale, la terapia psicodinamica interpersonale (IPT), la terapia sistemico relazionale ed il tradizionale gruppo di supporto “dei 12 passi” e la terapia coniugale o familiare, a seconda dei casi. Negli Stati Uniti viene utilizzato il Counseling online, pratica attualmente vietata in Italia agli psicologi, per disposizione dell’Ordine Professionale degli Psicologi, in attesa di una regolamentazione normativa. Ho fatto questo breve riepilogo teorico per poi farvi ritrovate questi stessi concetti in forma visiva in questa bella infografica sulla dipendenza da Internet – I.A.D. Internet Addiction Disorder. Lavorare con gli smartphones e il tablets: il sindacato olandese FNV pubblica una ricerca sui rischi per i lavoratori di smartphones e tablets. Come ben sappiamo, l’utilizzo di smartphones e tablet aziendali per lo svolgimento di attività lavorative comporta sia la presenza di rischi ben noti per la salute (prevalentemente rischi psicosociali e rischi muscolo-scheletrici e osteo-articolari), sia la dilatazione dei tempi di lavoro all’interno dei tempi di vita privata, con un significativo aumento delle attività lavorative – quasi mai retribuite oltre al nrmale stipendio – e una contrazione del tempo libero individuale. Su questo tema sta ragionando il FNV, un sindacato olandese che ha commissionato all’Università di Amsterdam una ricerca sui rischi per i lavoratori di smartphones e tablets. La ricerca è in in lingua olandese e potete scaricarla integralmente al termine di questo articolo, il comunicato stampa di presentazione della ricerca è presente a questa pagina ed è in inglese. L’ho tradotta per voi e potete leggerla di seguito. Più di 800.000 smartphone e tablet sono stati venduti nel 2012 – non tutti per uso privato. Un numero crescente di datori di lavoro hanno fornito al loro personale queste tecnologie, specialmente nel “knowledge business”. La Confederazione Sindacale Olandese FNV – preoccupata per l’impatto potenziale sulla salute dei lavoratori di un uso eccessivo di questi nuovi strumenti di lavoro, ha commissionato un rapporto all’Università di Amsterdam che è stato pubblicato a fine dicembre 2012. Il rapporto si intitola “Techno-Stress” e fa il punto su rischi emergenti da uso eccessivo di smartphone e tablet passando in rassegna la letteratura scientifica sulle minacce per la salute – principalmente rischi psicosociali e disturbi muscoloscheletrici. Dato che non è ancorara stata fatta nessun lavoro di indagine epidemiologica, l’autore del rapporto Jan Popma si basa principalmente sui dati di una ricerca svolta tra giovani utenti ancora in formazione, arricchita dai risultati di un sondaggio online a cui hanno preso parte 250 membri FNV. La relazione si concentra principalmente sui rischi psicosociali derivanti dall’uso sul lavoro di smartphone e tablet in termini di “tecno-stress” (“ogni impatto negativo sugli atteggiamenti, pensieri, comportamenti o fisiologia del corpo che è causato direttamente o indirettamente dalla tecnologia”) , “tecno-dipendenza” (uso compulsivo continuo, anche quando l’attività è manifestamente dannosa) e “techno-invasione” (situazioni in cui il confine tra lavoro e vita privata è eliminato). L’autore cita un sondaggio 2011 fatto tra 3.700 dipendenti. Uno su otto dei partecipanti di età compresa tra 22 e i 34 anni controllano il proprio cellulare più di dieci volte all’ora durante il loro tempo libero (“tempi morti”), e uno su tre controlla la propria e-mail subito dopo il risveglio, anche prima di vestirsi o la prima colazione, mentre il 29% dei “lavoratori mobili” che hanno preso parte (in tutte le categorie di età) ammette che il loro utilizzo della tecnologia mobile ha creato tensioni nelle loro relazioni personali, soprattutto con il partner. Questo rapporto evidenzia anche alcuni risultati ‘controintuitivi’ presenti nell’uso di lavoro delle nuove tecnologie di comunicazione. Anche se lo scopo della presenza tecnologica è di aumentare l’efficienza e la produttività, la possibilità di azione incontrollata sulle tecnologie stesse favorisce un distrubo continuo dello svolgimento del lavoro. 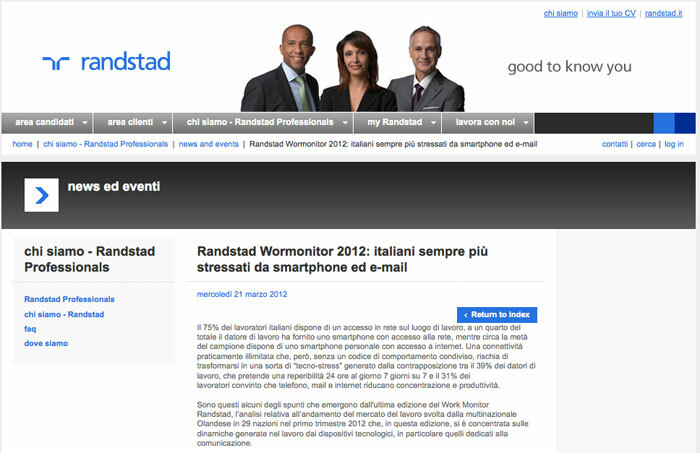 Ad esempio le interruzioni per rispondere alle email in arrivo comportano una significativa rottura nella concentrazione del lavoro in corso e compromettono la qualità stessa del lavoro. Dove la salute fisica è interessato, il rapporto individua il rischio di problemi alle dita, ai polsi, al collo e alle spalle. Il famoso “Blackberry Thumb”, il pollice da Blackberry (un cenno al precursore dello smartphone) è diventato stenografia comune. “Le condizioni ergonomiche in cui i lavoratori mobili lavorano probabilmente non raggiungono i requisiti delle leggi dell’ambiente di lavoro”, avverte l’autore. Le raccomandazioni dell’autore includono la limitazione delle e-mail al di fuori degli orari di ufficio. Egli indica la recente decisione di Volkswagen Germania di vietare e-mail a un dipendente di telefonia mobile oltre i 30 minuti dopo aver terminato il lavoro. “E ‘tempo per i sindacati di avviare negoziati per identificare chiaramente qual è il ‘tempo di lavoro effettivo‘ considerando i continui ‘start and stop’ dovuti all’utilizzo delle comunicazioni mobili.Non bisogna pensare di aspettarsi che i dipendenti siano disponibili per lavoro per tutte le ore dei giorno senza nessun guadagn extra” dice l’esperto di salute e sicurezza sul lavoro FNV Wim Van Veelen. Di seguito, trovate le ultime ricerche internazionali che ho recuperato sulla rete relative all’argomento Tecnostress. Segnalo un grande fermento sul tema in India, dl qualle arrivano due delle ricerche presentate. Come sempre, le ricerche sono disponibili in file pdf scaricabili. La tecnologia sul posto di lavoro è molto diffusa durante l’organizzazione e la condurre di operazioni commerciali di routine. La tecnologia consente all’utente finale di sperimentare il sovraccarico di lavoro, prendendosi in carico di molti progetti e di molte interruzione del lavoro da computer mal configurati, dispositivi obsoleti e interruzioni di rete. Il sovraccarico di lavoro (tecno-sovraccarico) e il blocco a causa della tecnologia hanno definito un nuovo termine nello stress lavoro-correlato, definito technostress. Questo studio ha esplorato i sentimenti degli utenti finali durante il lavoro in un ambiente tecnologico e il conseguente technostress creato. Venticinque i partecipanti, tra cui cinque partecipanti al progetto pilota, hanno condiviso le esperienze vissute prodotte dal lavoro con sistemi tecnologici nei loro ambienti di lavoro, come i leader dell’organizzazione vangano aiutati dalle tecnologie nella realizzazione degli obiettivi dei progetti, e come le esigenze della tecnologia hanno influenzato la cultura del lavoro. L’analisi dei dati delle interviste faccia a faccia è stata condotta utilizzando il software NVivo 9 con risultati in sei temi principali. Il tema “la leadership e la comunicazione” ha esplorato come gli utenti finali sentono il supporto leadership. Il tema “costruire utenti di computer in grado di gestire gli aggiornamenti semplici” ha esplorato come gli utenti finali sentono la mancanza di controllo sulla gestione delle tecnologie. Il tema “la cultura organizzativa e l’esperienza di lavoro” ha esplorato la cultura organizzativa nelle diverse imprese. Il tema “la dipendenza dalla tecnologia” ha esplorato la dipendenza dalla tecnologia rilevata dalla forza lavoro, un fattore inesistente alcuni decenni fa. Il tema “la sottomissione alle politiche in materia di tecnologie sul luogo di lavoro” ha esplorato come i rigorosi criteri del computer hanno effetti sui sentimenti degli utenti finali. Il tema “la dominanza creata dalla finalità del design della tecnologia” ha esplorato i sentimenti di accettazione dell’utente finale in ambienti di lavoro creati con l’esigenza di protezione dalle risorse tecnologiche. La comprensione di questi temi è in grado di guidare gli sviluppatori di tecnologia leader e organizzative per creare e migliorare l’ambiente di lavoro organizzativo producendo un ambiente di lavoro più user-friendly che ispira i lavoratori e il lavoro aumenta l’efficienza. I risultati e le raccomandazioni di questo studio per quanto riguarda il technostress sugli utenti finali sono grado di guidare il futuro sviluppo organizzativo, la gestione della leadership per creare un ambiente di lavoro ottimale per gli utenti di tecnologia hardware e software. Lo scopo di questo, studio qualitativo e fenomenologico è stato quello di sviluppare una comprensione degli effetti del technostress basati sulle tecnologie e il grado di soddisfazione degli utenti finali che ha usato i sistemi Hardware e Software per completare le attività di lavoro. Lo scopo dello studio è stato quello di cercare di comprendere il technostress corrente ulteriore composto di tecno-complessità, techno-insicurezza, techno-invasione, techno-sovraccarico, e techno-incertezza. Studio è condotto per identificare l’impatto della tecnologia sui professionisti delle biblioteche impiegati nelle scuole di ingegneria di Anna University, Tamilnadu. Un questionario è stato distribuito ai professionisti delle biblioteche e consiste di dati demografici, effetti fisici, fisici e sintomi psicologici della tecnologia sui professionisti delle biblioteche. Si è constatato che il 46,70% degli intervistati sono nella fascia di età 25-34, il 40,06% degli intervistati soffre di ipertensione e i professionisti delle biblioteche femminili sono soggetti a effetti fisici come l’obesità, il diabete mellito, le malattie cardiache, disturbi muscoloscheletrici e l’ipertensione. Anche i dati demografici quali lo stato civile, l’esperienza e il reddito mensile degli intervistati hanno un’influenza significativa sugli effetti fisici. Lo sforzo sperimentato dagli utilizzatori di computer dovuti al rapido sviluppo dell’ambiente tecnologico, noto come technostress, viene spesso ignorato, dato che non è riconosciuto come un vero tipo di stress psicologico, come lo stress post-traumatico, eccetera. Questo articolo si occupa di dimostrare che c’è una congruenza teorica tra technostress indotto dai computer e stress psicologico. Questo si ottiene esaminando l’insorgenza e la natura dello stress psicologico e confrontandola con le caratteristiche dei ‘technostressati’ favorito dai computer connessi la mano di un modello ben riconosciuto di stress psicologico. La constatazione derivante fatto è che la forte congruenza teorica esiste. Lo studio esplora e cerca di identificare i fattori psicologici di technostress nelle organizzazioni. I dati sono stati raccolti da 100 dipendenti in possesso di medie posizioni manageriali in diverse organizzazioni IT, con sede in India. La Cronbach’s alpha del questionario è risultata essere 0,786 e la correlazione di Pearson del 0,912 (p <0,001). L’analisi fattoriale della componente “fattori psicologici di technostress” ha portato all’estrazione di tre fattori indicati di seguito da varie organizzazioni. I tre fattori emergenti sono rispettivamente: “tecno-cognitivo-task-preoccupazione”, “techno-invasiva-emozionali-differenze”, “techno-invasiva-task-disaccordo”. I risultati indicano che questi fattori sono fonte importante di problemi cognitivi, emotivi e interpersonali a livello psicologico che i dipendenti a medio livello manageriale percepiscono e sperimentano sul posto di lavoro nel contesto indiano a causa del technostress. Consumerizzazione IT – definita come l’uso privato di tecnologie IT per per motivi di lavoro è in costante crescita, creando così nuove opportunità per le imprese. Mentre numerosi studi suggeriscono un effetto positivo di questa tendenza sulle prestazioni dei dipendenti di lavoro, la ricerca non ha ancora una comprensione sistematica delle forze alla base di questo rapporto. Per colmare questo divario nella ricerca, deriviamo tre effetti principali della consumerizzazione IT nei dipendenti: 1) un maggiore carico di lavoro 2) l’elevata autonomia e 3) un più alto livello di competenza. Sulla base del modello di stress cognitivo e l’autodeterminazione teoria, sviluppiamo un modello innovativo teorico delle relazioni tra IT consumerizzazione e la prestazione lavorativa. Abbiamo poi condurre una incorporato singolo caso di studio, al fine di valutare i costrutti e le relazioni del nostro modello strutturale per mezzo di ricerca qualitativa. Successivamente, sono affrontate le implicazioni per l’organizzazione e la pratica della consumerizzazione, e sono proposti dei suggerimenti su un ulteriore sviluppo di questo studio. Le tecnologie dell’informazione e della comunicazione sono impiegate in ogni aspetto della vita contemporanea. Facilitate dall’ICT, molte innovazioni nell’organizzazione del lavoro hanno preso piede. Gli effetti di questi sviluppi sulla qualità della vita sono controversi. Con riferimento al fenomeno della technostress, gli studiosi mettono in guardia contro gli effetti potenzialmente nocivi delle ICT sulla salute dei lavoratori. Questa linea relativamente nuova di ricerca vede le fonti di stress per l’individuo nelle caratteristiche delle ICT. Il presente lavoro è motivata dalla constatazione che le ICT si radicano nei rapporti sociali. Il modo in cui vengono utilizzate è fortemente influenzato dalle norme sociali e di creazione di senso. Sulla base di ciò, questo studio teorizza nuove fonti di stress provenienti dalla sfera sociale abilitata e facilitata dalle ICT. In particolare, il lavoro analizza la nozione di adeguatezza come blocco per la costruzione teorica di una comprensione più complessa dello stress nei luoghi di lavoro attuali. In tal modo, il documento mira a stabilire un nuovo quadro teorico in grado di indagare nuove fonti di stress a livello teorico e empirico.